I wrote a post about SocialSpark two weeks ago but I hope to share much of what I have experienced, and am still on Cloud 9 from the experience. In fact, I had every intention of highlighting all of those benefits. All I can say is AWESOME and I like it...a lot! Basically it is a great place to start building a community. 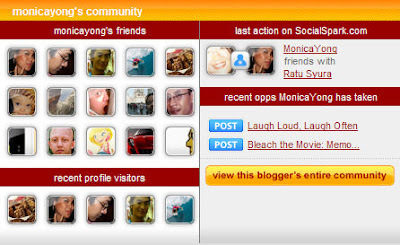 In other words, it allows bloggers to share information about themselves, their readers and their blog content. You can search for complimentary matches, interact with each other, create networks, issue ratings, send messages, and ultimately capitalize on shared interests. 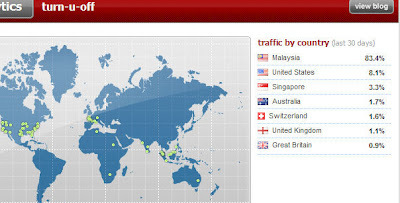 It will also a good start to build your blog traffic. Blogs are read by many readers who share common interests and empowering bloggers represents a huge value proposition to advertisers. With SocialSpark's open analytics platform, advertisers can see the actual traffic and demographics of blogs they sponsor or a vertical network of blogs they sponsor. If you are looking for additional ways to monetize your blog, why don't you try SocialSpark as it provides so many opportunities for ordinary people like you and me to make some money. Yes, you can use this to earn some dollars through opportunities, while increasing the value you provide to your readers. Another reason why I like SocialSpark is because of their code of ethics. 1) 100% Audit-able In-Post Disclosure. You can tell your readers that you are being paid to write the about the sites, products and services that you support. 2) 100% Transparency. The public can also see which bloggers are working with which advertisers on which opportunities. 3) It allows you to write a review based on your 100% real opinions. 4) 100% Search Engine Friendly. Each sponsored link automatically carries the "no-follow" attribute. Therefore, it will not affect search engine rankings. 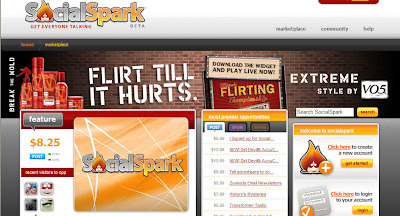 So far I can only recommend you to check it out and give SocialSpark a try!!! hi monica! congratulations and welcome to social spark, in case you want to add me there my username is mlizcochico.